Over the years, I have been frustrated that there is no central calendar that shows race activities for tandems. BikeReg or even USA Cycling does not have a way to sort or filter tandem categories. By comparison, finding tandem rallies is easy, there are a number of tandem sites with that information but not a single one has a repository for racing category. So every year I have to go and “hunt” racing events to see which ones have Tandem Categories. I am happy to volunteer to lead the racing group of Tandem Club and would volunteer (as I am now) to add races anywhere in the US, both road and mountain bike events. There are a lot of races with MTB or Road Tandem category…people actually participate in them! Right now I mostly focus on races to which I might go…so mostly within a 10-hour drive from our home in the Northeast. I do feel a bit guilty because I know that in the West there are many tandem riders, and I have not added many of races out there. I understand that the Tandem Club as an organization is about bringing together tandem enthusiasts. This is a encompassing mission which includes tandem rallies AND races. It also includes road tandems AND mountain bikes tandems. I believe that providing enough content — in my case, events — to reach a broad market is critical for this group to grow and be sustainable. Sure, if this was the “Rally Tandem Club”, then I would fully agree that racing should not be included. I see the Tandem Club as the lead in providing tandem related information to our community. That is broad enough of a mission to include races, MTB, etc. All of the races I provided have a specific Tandem Category. They also have singles, etc., but have a separate Tandem Category. None of them are professional Tandem Racing, requiring a licensee. They are the “citizen” type. I do think we should include license racing too, however, there are very few of those events. 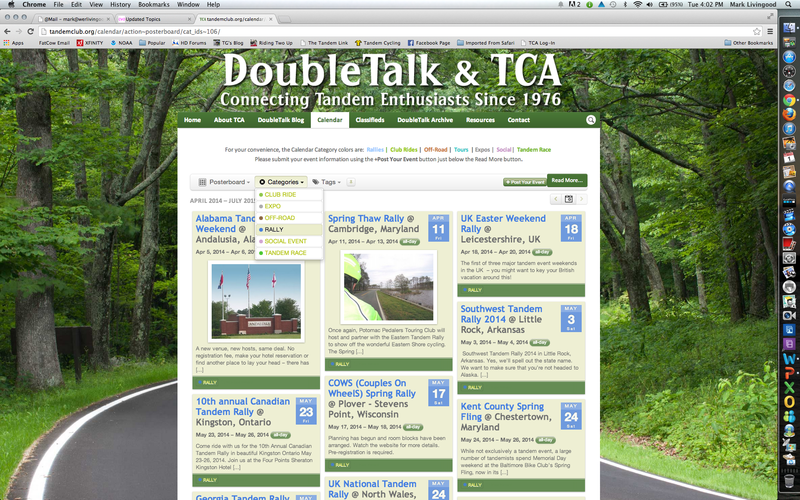 Being able to see a Tandem Calendar and have many events is a good thing! It shows that there is a lot of activity in this community. The current site can very easily sort by specific groups “Rallies”, “Club Rides”, etc. So I don’t see having a lot of events listed as being a problem…quite the the opposite…I see it as a benefit! I can understand that in the print version of DoubleTalk, you have to balance printing costs vs interest. But now that we have moved to a web-based system, having a calendar of 15 events vs 150 events has little impact in costs. With this new format we can add events that may benefit a smaller segment of the community but still within the tandem community. I am curious why you feel that it is not our charter to list Tandem events (races, rallies, etc.) across the world? Does Tandem Club have a geographic focus of just rallies, or a geographic focus of only USA? I somewhat assume that the Tandem Club was worldwide…but I don’t actually know. I have seen some rallies listed in England or Europe. My personal focus is the USA but I certainly do enjoy reading about events overseas. I think these are the kinds of questions that make the book “The Tipping Point” by Malcolm Gladwell a great read. The idea that small decisions can create big, but indirect impact in our community and society. I think I mentioned that I was very sad to see DoubleTalk go away in print form. For me that was a wake up call that I need to get involved to make sure that the future of tandem riding is vibrant and includes older and younger riders, rallies, races, etc. When we show our calendar with multiple activities, we are showing a vibrant group with lots of options. It absolutely a benefit to all of us! It is these small steps that create “The Tipping Point” in our lives. Certainly it is a way that we can increase readership and interest in the group. Carlos Garcia has been riding, touring and racing tandems for 15+ years and has recently added a triplet and off-road tandem to his riding repertoire. Carlos has taken the role of TCA Calendar Editor to expand our reach to broader events while still remaining tandem focused. We will be covering the typical tandem rallies and adding more racing, mountain bike and touring/club rides to the calendar. Our previous calendar in Double Talk had limitations been a printed publication, now our web site can filter by Event Categories to help users focus on just the Events that they want to see. The Event Category filters are quite powerful and can gives us the best of all worlds – a richer community without losing focus. 6 Responses to "Racing Group in DoubleTalk"
Carlos has submitted a large number of races and club events that include a tandem class, and we thank him for his contributions and leadership! We haven’t posted them all, for the time being, as we try to establish a balance of what the DoubleTalk Calendar should be. The sheer number of the postings threatens to overwhelm the exclusively-tandem Event posts. But we share common ground. The TCA enthusiastically supports all things tandem cycling, from whimsey to tandem mechanics, on- and off-road, events, race, rally, and tour. We support contributions and events worldwide, but focus on those in North America; with deference to other national tandem organizations, we are, after all, the Tandem Club of America (albeit with decades of international participation). We also agree that an extensive Event Calendar is better than a thin one, and are gratified by the phenomenal growth in the number of tandem-focused events. As Editors, a core question is how do we distinguish between tandem events, and events that include tandems? Do we restrict the Event Calendar to events primarily or exclusively for tandems, or do we feature events that are primarily for half-bikes but include a tandem category or accept tandem entries? And where does that stop? Carried to logical conclusion, if we support all events that include tandems, shouldn’t the Calendar list virtually every invitational cycling event in North America, or for that matter, the world? On the other hand, if we limit racing events to those restricted to tandems, we will list virtually none. Do we maintain one policy for tandem rallies and a different standard for races that include tandems? Alternately do we maintain two separate Event calendars, one for tandem events and a second for events that include tandems? What about a regional tandem club’s local rides? Or do we rely on our readers to use of the Category Filters (a feature near the top of the Event Calendar) to winnow their interests from their subjective chaff? How and where do we find the right balancing point? Just a few thoughts. We enjoy “spirited rides” quite a bit, although we have never raced, but would definitely like to see races included on the calendar. It opens up new opportunities to ride with other tandems as well as satisfies our fondness for challenging rides. The calendar is easy to sort and filter by category, so seeing events that either are or are not interesting to you is pretty straight forward. I am not sure about international listings, but it would be helpful to include a the City and State in the title of each calendar listing. Last, thanks for putting all of this effort in to it! Why not a calendar for each? Click on your interest and there it is uncluttered with stuff you are not looking for. The TCA team did a great job with the website and calendar capability. Currently the calendar default view is “All Events”. You can select single (or even multiple) category(s) in the “Category” pull down next to “Month”. So if you select “Off-Road” the calendar would only show events in the “Off-Road” category. By selecting your preferred category, in effect you have a “calendar of each” event type. Would that achieve your suggestion? As Carlos notes, the Calendar already has built-in filters that allow readers to see only the events that are of interest. Moreover, readers can also elect to see the events in the posterboard format that comes up as a default, or as a by-month calendar, or as a linear list. To the broader question as to “where do you find the balancing point” my take is fairly pragmatic: if it’s not an event that is designed for tandem cycling enthusiasts or one that is at least renown as a major draw for tandem enthusiasts then it probably doesn’t belong on the TCA calendar. I say this as the TCA and Tandem Club Websites in general are designed as a two way street: they let tandem event organizers target a specific community of interest where there is a strong likelihood that readers at that site clearly have an interest in tandem cycling events while, at the same time, giving readers the ability to see a carefully filtered list of events that are designed to appeal to tandem enthusiasts. After all, just about every cycling event short of some truly epic off-road adventure or fully sanctioned USCF race, will allow tandems to participate, i.e., they’re not hard to find which is not always true of tandem events. Case in point, do a Google search on “Mt. Wachusett Hill Climb” and see how many different websites are carrying information on the event. Now do a search on something like “Southern Tandem Rally” or “Northwest Tandem Rally”. While there are a lot of “hits” for the tandem events, you’ll quickly realize it’s a pretty small constellation of hosts spread over a huge geographic area who have information on the event, many of whom have simply harvested the information off of one or two different calendars. Having hosted and moderated tandem event calendars at my own site for 14 years and for the Georgia Tandem Club in parallel, it has been my experience that just about anyone who is looking to promote an event – with all good intentions – will reach out to any free exposure they can. I have turned away hundreds of requests to “please add my event to your calendar” where the event would welcome tandem cyclists but clearly didn’t offer them anything special in terms of the event experience. So, at least from my perspective, there needs to be a firewall between “cycling events that welcome tandems” and “tandem events” when it comes to a calendar of events being maintained for the benefit of tandem enthusiasts. Trust me, you really don’t want to have to sift through a dozen Southern Bicycle League events in the TCA calendar, noting that any of those events will gladly register tandem teams. 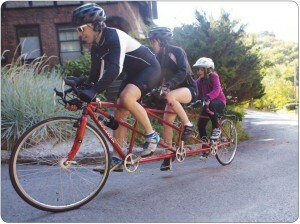 As for race events that offer a tandem class, I think that’s great. But I also recognize that only about 2 out of every 100 tandem teams has any interest in racing at any level. So, how to go about making that information available? Well, off the top of my head I would initially recommend a nice blog entry that lists those events perhaps on an annual, quarterly or seasonal basis… just to test the waters. If the comments section for those posts explodes with event pre-coordination postings and we see a strong flow of blog interest in competitive tandem cycling then perhaps greater integration would be appropriate. Again, the challenge is making sure there is a balance that recognizes only a small number of tandem teams and TCA members have any interest in riding off-road, on the track or bumping elbows in a crit. Finally, as for conquering the rest of the world: near term the TCA’s goal is simply trying to migrate the 600 or so members that were on the books at the end of 2013 from the mailbox to the blog and so far we’ve only got about 40 or so subscribers. So, after TCA secures the American continent – including our friends to the north and south who ride tandems –perhaps they can reach out to our International partners in a more proactive fashion. Again, just my view as a junior partner not a member of the board, so to speak. The senior leadership is always welcome to consider my inputs, but has no obligation beyond that. In closing, I love your enthusiasm. I would encourage you to reach out to Henry Able who hosts the Northwest Tandem Racing website in Bend, Oregon (http://nwtandemracing.com/) to see if there would be some way to build a resource in the Northeast US to parallel what he has put in place for the Northwest US, and then work to build a bridge of other regional tandem racing information hubs across the US. Collectively, perhaps there is enough growth taking place in the competitive tandem cycling community to entice the national organizations to add the infrastructure needed to help promote tandem racing with searchable event listings and the like.